We’re proud to be a part of another phenomenal revitalization project, this time in Buffalo, NY. 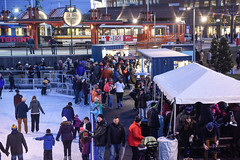 Introducing The Ice at Canalside presented by BlueCross BlueShield of Western New York. 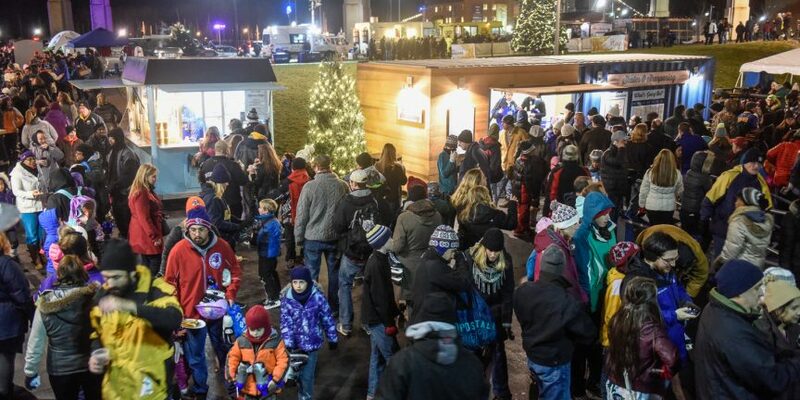 At 33,000 square feet, the downtown ice rink is the largest outdoor ice rink in New York State and has already attracted over 27,000 visitors in its first month of operation! 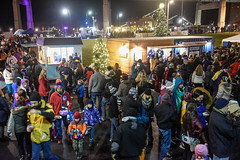 For The Ice at Canalside, we designed, fabricated, and delivered two modified shipping container structures to act as the point-of-sale and equipment rental center. 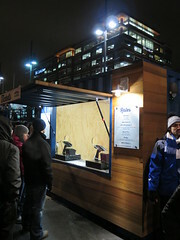 The idea was to provide everything a visitor needs to get on the ice by seamlessly moving them through the process. 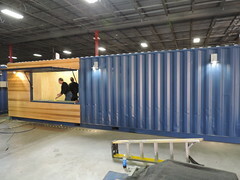 There’s even enough room in the structure for equipment maintenance and storage. 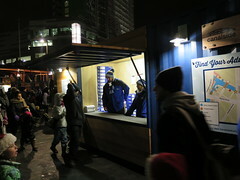 Cut from a single decommissioned 40-foot shipping container, we built one 10-foot space to act as Ticket Sales and a 30-foot environment for rentals and storage. 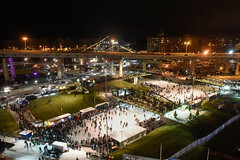 “The Ice at Canalside has seen unprecedented success in its first season of operation and has quickly become an iconic destination for thousands of visitors. We could not have done it without the support of our many great partners, like the team at Boxman Studios. They are committed to providing us with a high-quality product that meets Canalside’s ever-changing needs, including variables like weather and product use.” – Erie Canal Harbor Development Corporation President Tom Dee. 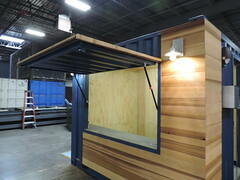 To reflect the historical significance of the lively port that was once the site of the Erie Canal Harbor, the container environment blends exposed metal corrugate with finished wood-cladding and decorative exterior lighting. 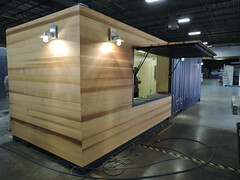 The cedar planks are attached via a custom framing system that allows the wood to flex in transport, ensuring that the units arrived in Buffalo in the same condition they left Charlotte. To combat extreme cold and high winds we created watertight seals around the awnings and doors, and used moisture-resistant sealants throughout the environment and on all materials. Our meticulous construction method is what made it possible for us to deliver the structures intact and on time, just a few weeks after the snow storm that left the Buffalo region under over seven feet of snow. Known as America’s “Gateway to the West,” the Erie Canal Harbor was built in 1825. It was one of the world’s greatest business centers, consistently bustling with ship and rail traffic transporting goods to and from countries all over the world. Soon people settled near the canal and a thriving metropolis was born. However, due to the opening of the Saint Lawrence Seaway and the rise of trains and automobiles in the early 20th century, the need for the Harbor dissipated, and the site was filled in with stone and dirt. In 2005, a community driven initiative led to the formation of the Erie Canal Harbor Development Corporation (‘ECHDC’), a state entity with the sole goal of revitalizing the waterfront and restoring economic growth to Buffalo while remaining true to its industrious roots. 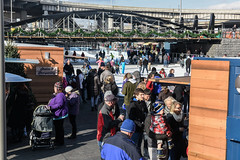 The new Canalside development, spearheaded by Governor Andrew M. Cuomo, hosts thousands of events all year long and attracts one million visitors annually. As the weather warms, and the ice melts, the containers will serve a new purpose to accommodate summer activities at the canals. 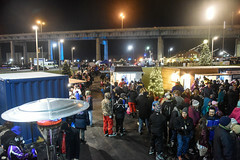 With the attraction’s ever-increasing popularity, expect to see more container structures at Canalside, serving as anything from coffee shops to indoor gardens. We thank EDHDC for the opportunity to make history with the citizens of Buffalo. We are excited to create unique temporary and mobile spaces for redevelopment & revitalization projects around the country.